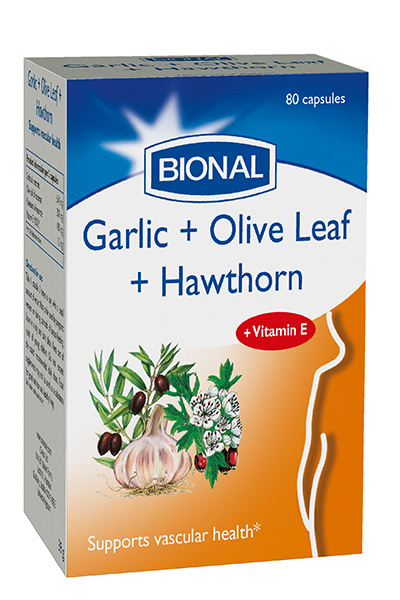 *Garlic + olive leaf + hawthorn contains plant extracts of Garlic, Olive and Hawthorn that support vascular health. Vitamin E contributes to the protection of body cells against oxidative stress. Garlic + olive leaf + hawthorn is produced according to high quality standards. Take 1 capsule 3 times a day with a small amount of water. Not to be used by pregnant women or during periods of breast-feeding. Store in a dry and dark place. Keep out of reach of young children. Do not exceed the stated recommended daily dose. Food supplements may not be used as a substitute for good nutrition and healthy living. Garlic oil macerate (Allium sativum, sunflower oil) (33%); gelatin; olive leaf oil macerate (Olea europea, sunflower oil) (19%); hawthorn oil macerate (Crataegus laevigata, sunflower oil) (11%); gelling agent: glycerin; vitamin E (as d-alphatocopherol).